SEVEROMORSK, October 15. /TASS/. The aircraft carrier task force of Russia’s Northern Fleet has started its voyage to the North-East Atlantic and the Mediterranean Sea, the fleet’s press service said on Saturday. 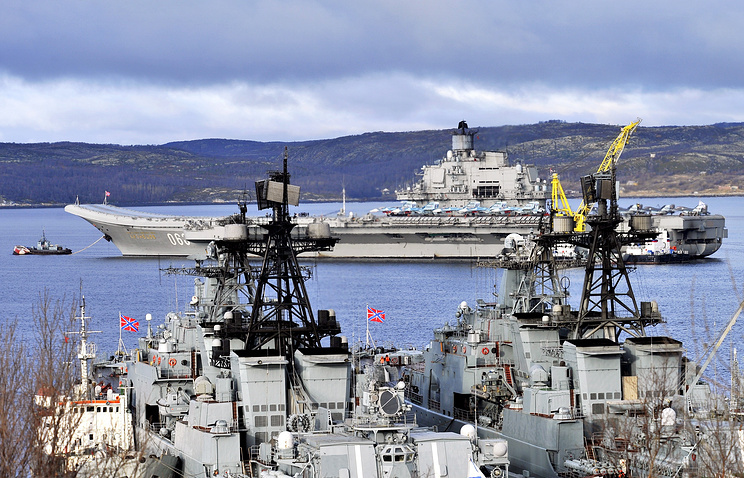 “The group consists of the aircraft-carrying heavy cruiser Admiral Kuznetsov, the Pyotr Velikiy battlecruiser, large anti-submarine ships Severomorsk and Vice-Admiral Kulakov and support vessels,” the statement said. The previous joint voyage to the North-East Atlantic and the Mediterranean Sea of the Admiral Kuznetsov and Pyotr Velikiy was completed in the first half of 2014. The current long voyage is the eighth one for the Admiral Kuznetsov aircraft carrier. September 3 – The Sukhoi Su-33 air superiority fighters based on the Russian aircraft carrier Admiral Kuznetsov that is scheduled to be deployed to the Syrian shores in November will be outfitted with an ultra-precision targeting system, known as the SVP-24, Izvestiya reported, citing an unnamed source in the Russian Defense Ministry. The system, developed by Russian defense contractor Gefest & T, w…ill allow Russian warplanes to drop unguided bombs with the same precision as a guided weapon. In addition, the Mikoyan MiG-29K 4++ generation multirole fighter aircraft recently added to the Admiral Kuznetsov’s roster are expected to use guided bombs and missiles against militant targets in Syria, the newspaper added. The SVP-24 is tasked with determining the optimal trajectory for the release of a bomb, using the plane’s location, flight parameters and target data. It has already made a good showing during Russia’s counterterrorism campaign in the embattled Arab country. “The Su-24s outfitted with the SVP-24 have become the workhorse of the Russian Aerospace Forces in Syria,” defense analyst Anton Lavrov told the newspaper, adding that the system is a viable alternative to GPS-guided munition popular in the West. Moreover, the Russian solution is cheaper than similar products developed elsewhere. An American military analyst, known as The Saker, explained how this system works. The SVP-24 compares the position of the aircraft and the target and measures the environmental parameters, including humidity, windspeed, angle of attack, etc. It can receive additional data from AWAC aircraft, ground stations and other planes. The system then “computes an ‘envelope’ (speed, altitude, course) inside which the dumb bombs are automatically released exactly at the precise moment when their unguided flight will bring them right over the target (with a 3-5m accuracy),” the analyst added. “In practical terms this means that every 30+ year old Russian ‘dumb’ bomb can now be delivered by a 30+ year old Russian aircraft with the same precision as a brand new guided bomb delivered by a top of the line modern bomber,” the expert noted. (FNA)- The Russian Navy is to dispatch its only aircraft carrier, Admiral Kuznetsov, to the Eastern waters of the Mediterranean Sea to join the anti-terrorism operations in Syria, media reports said. “The Russian navy will dispatch the aircraft carrier to Syrian waters in autumn. Admiral Kuznetsov aircraft carrier will be deployed to Eastern Mediterranean Sea between the months of October 2016 and January 2017,” a Russian diplomat was quoted by media sources as saying. “The carrier will be deployed to the nearest distance to Syrian lands to have enough fuel for long-distance combat flight over the country,” the sources further added. “The carrier is projected to host at least 15 Sukhoi-33, Sukhoi-27 and Mig-29 and 10 choppers of K52, K27 and K31 in Syrian mission,” the source went on to say. Reports said on Sunday that a huge cargo vessel of Russia, carrying a large volume of arms, ammunition and other advanced types of military equipment for the Syrian Armed Forces, entered waters of Mediterranean Sea. The huge Russian vessel of Grigori Bobidovich, which left the port city of Novorossiysk in Russia a couple of days ago, passed Bosphorus strait and entered the Mediterranean sea waters en route to Syria. The Russian vessel’s final destination is Syria’s Tartous port, the main logistic center of the Russian Navy in Mediterranean sea, to unload its cargo and deliver them to the Syrian armed forces. In last two week, at least four huge cargo vessels of Russia have left Bosphorus and Dardanelles straits, carrying military consignments for the Russian fighter jets and Syrian army. Media reports said on Thursday that the Russian warship, BSF Saratov, sailed through the Bosphorus and Dardanelles in the Black Sea and entered the Mediterranean Sea. According to Syria al-Aan, the Turkish websites have released some photos of the warship sailing through the Bosphorus strait. They reported that Saratov left Novorossiysk port in the Black sea towards Tartous port in Syria. They also claimed that the warship was carrying a big cargo which has been covered. This was the sixth voyage of Saratov warship in the current year. Russian warships and naval vessels, often two at a time, have been seen passing through the Straits en route to Syria from Russia’s Northern Black Sea ports with increasing frequency this year. Most of the military supplies, weapons, ammunition, and equipment that Russia supplies to the Syrian government are shipped from ports on the Black Sea, primarily Sevastopol and Sochi, through the Bosphorus and the Dardanelles, to the two Syrian ports, Tartous and Lattakia. A US destroyer violated international and bilateral agreements by approaching a Russian ship dangerously close this month, the Russian Defense Ministry said in a statement Tuesday. “US destroyer Gravely made a close encounter with a Russian warship in the eastern Mediterranean on June 17 at a distance of 60-70 meters [197-229 feet] on the port side and crossed the Yaroslav Mudry’s course along the bow at a dangerous distance of 180 meters [590 feet],” the ministry said. It brought to the Pentagon’s attention the “gross violation by the Gravely destroyer’s commander and crew” of International Regulations for Preventing Collisions at Sea and a similar Russian-US intergovernmental agreement. The United States Navy has deployed an additional four aircraft carriers on combat duty. As a result, the number of simultaneously deployed aircraft carriers has reached six for the first time since 2012.On June 1, the USS Dwight D. Eisenhower was sent from the US east coast to support the USS Harry Truman in the Mediterranean. On June 4, the USS Ronald Raegan was reportedly deployed from a naval base in Japan to the South China Sea. Two more flattops, the USS Carl Vinson and the USS George Washington, left their bases for training maneuvers. On June 6, US Navy destroyer Porter began its 21-day routine patrol of the Black Sea in support of Operation Atlantic Resolve. The deployment drew criticism from Moscow for destabilizing the region. Black Sea Fleet spokesman said that Russian Buyan-class Serpukhov guided missile corvette has entered the Mediterranean Sea to conduct a mission as part of Russia’s permanent naval task force in the region. The Russian Buyan-class Serpukhov guided missile corvette has entered the Mediterranean Sea to conduct a mission as part of Russia’s permanent naval task force in the region, the Black Sea Fleet spokesman said Wednesday. “Today, the Black Sea Fleet’s newest Serpukhov corvette left Sevastopol to implement tasks as part of a permanent naval group in the Mediterranean Sea,” Vyacheslav Trukhachev said. The Serpukhov is set to replace the Zeleny Dol missile corvette in the Mediterranean. The Black Sea Fleet received both corvettes, which are armed with Kalibr (SS-N-27) anti-ship missiles, earlier this year. Designed by the Zelenodolsk Design Bureau and assembled at the A.M. Gorky Zelenodolsk shipbuilding plant, the Serpukhov arrived at Sevastopol last November and had the St. Andrew’s Flag raised on it the following month. The Serpukhov and the Zeleny Dol are the fourth and fifth modernized Buyan M-class vessels built as part of the Navy’s current shipbuilding program.